The Downers Grove Police Department is participating in a year-long initiative that focuses on impaired driving and seat belt enforcement on specific holidays, including St. Patrick's Day. This initiative is in partnership with the Illinois Department of Transportation (IDOT) and is funded with an IDOT traffic grant. The grant funding must be used specifically to cover manpower hours for these holiday traffic enforcement campaigns. As part of the St. Patrick's Day holiday emphasis, officers will be working saturation patrols that target impaired drivers and seat belt violations. Whether you simply enjoy the company of friends, attend a parade or make a trip to a local pub, if a friend is showing signs of being impaired, don't let them get behind the wheel. 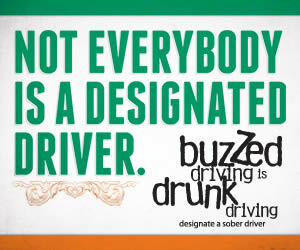 If you have had a couple of drinks and are feeling "buzzed" don't drive because YOU ARE IMPAIRED. If you spot an impaired driver on the road, do not hesitate to call 9-1-1. Officers will do everything they can to locate the motorist and make a determination whether or not they are impaired. Remember, Buzzed Driving is Drunk Driving.